Full back Jack Stacey was pleased to see his side show they have the ability to grind out a result during their 1-0 FA Cup victory at Bury on Sunday. 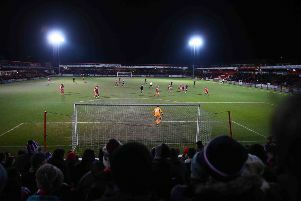 After home games in which Town had scored five and four to hammer Plymouth and Bradford, sandwiching a 3-1 success at Gillingham, Luton set up in more of a containing pattern for their clash at Gigg Lane. It worked though, as despite having limited clear-cut chances, Harry Cornick grabbed the only goal of the game, as Town then shut out a team who had scored 22 times in November to pick up a second successive clean sheet. Stacey said: “It was a tough game, they’re a good team to play, we’ve watched videos of them and they’re in very good form, especially at home. “They’re winning fours and fives against League Two teams, so we knew we were in for a battle, and we’re happy with the 1-0 victory and another clean sheet. “We knew they were going to have possession of the ball. “They were moving it well, we tried to press high and they got out a few times, so we sat a little bit deeper, and ended up managing to cope. “They were very good on the ball and did well, but this win is as important and as enjoyable as beating Plymouth and Bradford at home. “Maybe we showed a different side to us that we can kind of grind out a result if we’re not the team constantly in possession of the ball and carving through teams. “We’ve had to adapt as we knew they’d have a lot of the ball. The defender is now part of a back four that has played the last eight league and FA Cup games, conceding just three goals in that time. With Matty Pearson and Sonny Bradley forming a solid central defensive partnership, Stacey has been on the right with James Justin deployed on the left. Now Dan Potts is fit again though, Stacey knows performance levels must remain high if they want to keep their places. He continued: “They’ve (Pearson and Bradley) come in and both done really well. “It’s nice to play alongside then, they’ve been solid, we haven’t conceded many goals, we’ve got a lot of clean sheets recently, so those two are a massive part of that. “I’m happy with how it’s going, we’ve got a great squad, so to keep your place you have to maintain high levels of performance. “That’s always pushing everyone on, as Danny Hylton’s starting on the bench at the moment, so that says it all about our squad at the moment. Town can turn their attentions back to the league again this weekend, hosting Fleetwood Town at Kenilworth Road. Although Luton go into the game knowing a win could take them up to second place, Stacey wasn’t looking too far ahead, rather just determined to continue the form that has seen his side win eight from 10 in front of their own fans, drawing the other two. He added: “Maybe its too early to be talking about that (promotion), but we’re third in the league. “So if we can carry on our home form and start picking up even more points away, then who knows? “We look forward to playing at the Kenny at the moment.